Earlier this month, my parents and I decided to drive up to the Chikmagalur hills in Karnataka, India, for a three-day break in the heart of a coffee plantation, just as harvest season was beginning. The Thotadhahalli Homestay is a stunning 75 acre property with a traditional Kannadiga style house complete with two hundred varieties of bonsai, about a hundred different cacti, and plush with antiques and artifacts. The hosts have let six of their rooms as holiday accommodation, and all meals are included in the tariff. We're talking 4 sumptuous home-cooked meals a day, prepared and served with great gusto and generosity, and representing some of the tastiest dishes in Kannadiga cuisine. So without further ado, let's launch into food! Most of these Karnataka dishes were eaten at the homestay, but a few of them were sampled enroute to Chikmagalur too. I do hope you have an opportunity to try some of these local Kannadiga food delights if you visit Karnataka. 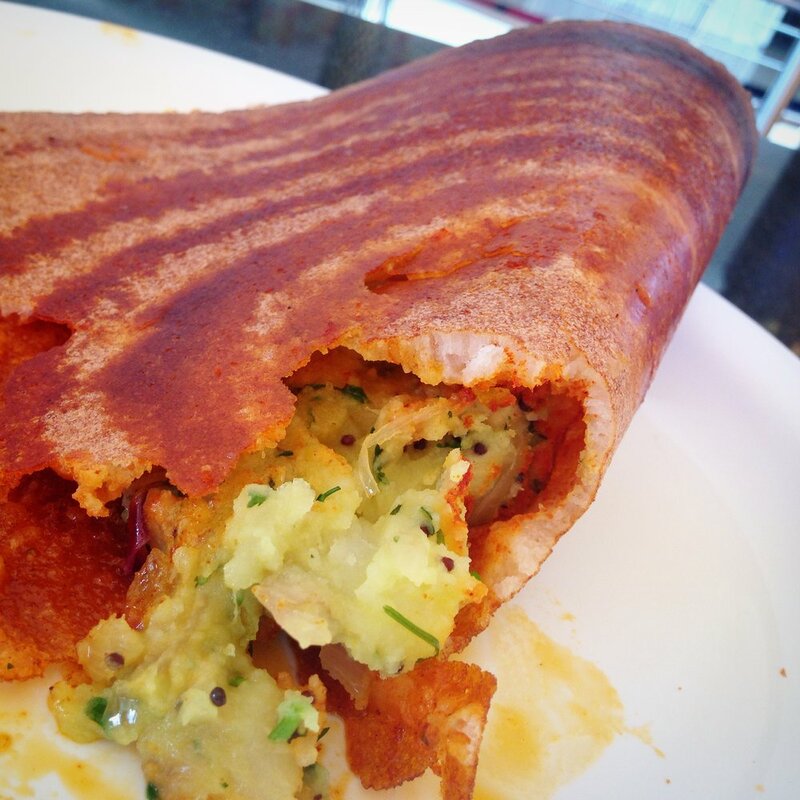 Masala dosaMasala dosa is popular throughout South India, and each state has it's own way of preparing this rice and lentil pancake filled with spiced potatoes. In Karnataka, the dosa is slightly thicker than its Tamil Nadu counterpart, and is soft on the inside and crisp outside. It is also coated with a red chutney (made of onion, garlic and red chillies) before it is filled. The potato filling is also less gooey than it is in Tamil Nadu. I'm a big fan of dosas, especially the crisp variety, but this one we had at Swathi Delicacy on National Highway 75 (old no. 48), enroute to Chikmagalur from Bangalore, was fantastic. Rava idlis are a steamed breakfast staple, made with semolina and yogurt, and spiced with cashewnuts, mustard seeds, chillies, ginger and curry leaves. Popular throughout South India, the Kannadiga version differs in that it has LOADS of corainder leaves too! 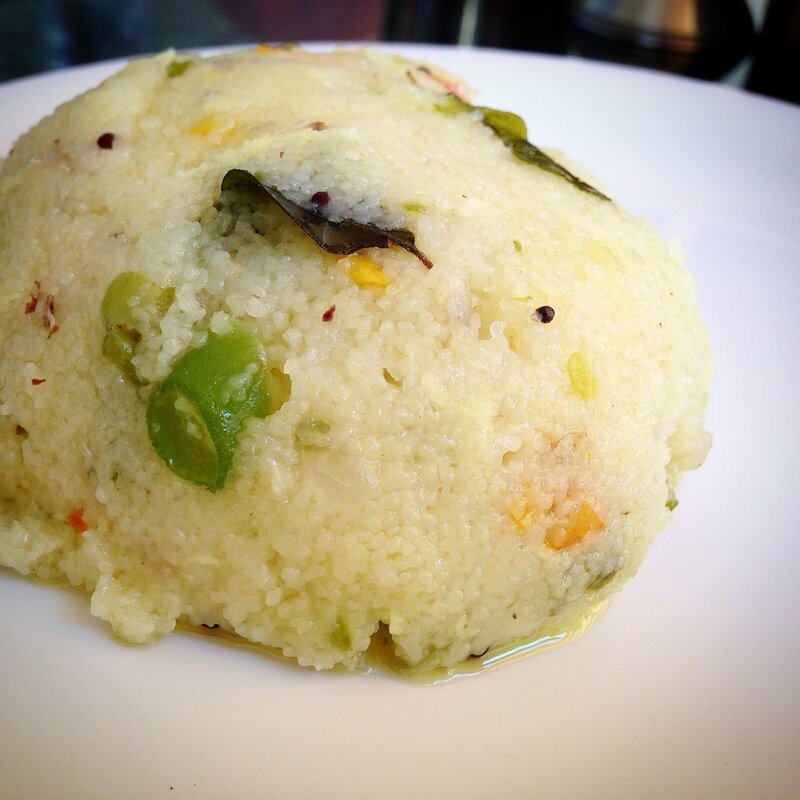 Another breakfast favourite, upma is a deliciously soft and delicately flavoured semolina preparation. Finely chopped vegetables are added to a tadka of ghee, curry leaves, mustard seeds, urad dal and ginger, to flavour the semolina. The ingredients are allowed to slow cook for a little while with milk and water, to soften the grain and give the upma its slightly sticky consistency. Manchurian or manchoorien (as it's called in Karnataka), is India's favourite Chinese import, spiced with Indian flavours. Gobhi manchoorien remains the country's favourite - cauliflower florets dipped in batter and fried crisp and then cooked with coriander, chillies, garlic, ginger, onions, soy sauce, tomato sauce, vinegar and black pepper. This is a mouth AND eye watering dish! This rice flour preparation is fun to make and eat! Boiling water is gradually added to rice flour to make a dough. The dough is then pressed through an idiyappam press to make little piles of noodles. These are then steamed. Voila! A very tasty accompaniment to traditional South Indian curries. There are several different recipes for a Kannadiga style chicken curry or koli saaru. I loved them all. Some are hot and fiery, others coconutty, some tangy, all delicious. This is a spiced yogurt preparation made in several South Indian states. In Tamil Nadu it's called Mor Kuzhamba. In Kerala, Moru Kootan, and in Andhra Pradesh, Majjiga pulusu. The yogurt and buttermilk mixture is flavoured with cumin seeds, coriander seeds, curry leaves, mustard seeds, peppercorns, ginger, asafoetida, chillies and bengal gram. It's spicy, tangy and cooling, all at once. Fantastic with a steaming bowl of rice. I was introduced to appey or kuzhi paniyaram, as these little wonders are called in Tamil Nadu, by my husband, a few years ago. Can't get enough of them! 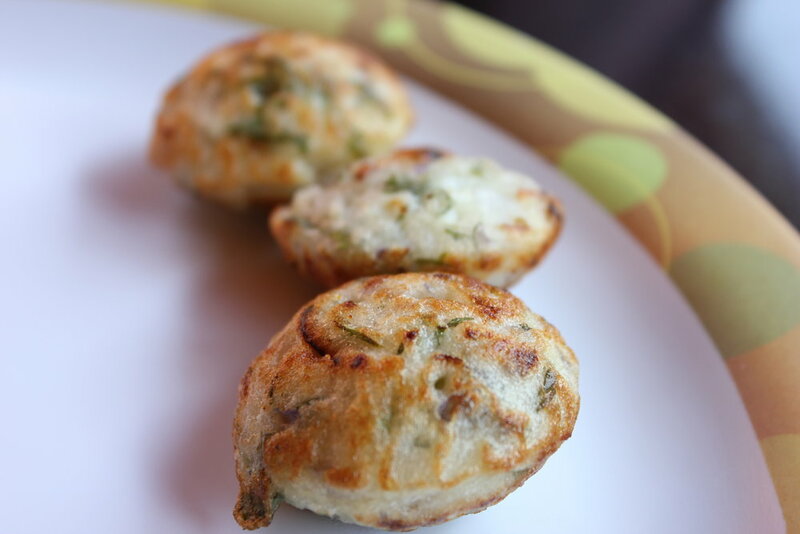 They're light, fluffy, bite-sized, and perfect with coconut chutney. They're usually had for breakfast, and made with leftover idli/dosa batter. Spike the batter with sauteéd onions, grated coconut, mustard seeds, curry leaves, urad dal and chilli, then pour into a special appey pan that's been lightly greased, cover, cook, and pop out! Yum. Akki roti is a roti or chapatti (Indian flatbread) made with rice flour dough, instead of wholewheat flour dough. It's crumbly and flaky and it was served with a side dish made with colocassia leaves, in Chikmagalur. This is a very refreshing side dish, more a salad, that complements a spicy curry meal beautifully. Cucumber, moong dal, chillies, coriander, lemon juice, all tossed together, and tempered with curry leaves, mustard seeds and urad dal. Quite lovely. A rice and carrot pudding, this doesn't sound very appetising, but it was delicious! This is a deep fried savoury snack made with rice flour, plain flour and semolina. The flours are spiced with onions, curry leaves and chilles, made into a dough, divided into balls, flattened into patties and fried. Yummy! The ragi grain is grown in abundance in Karnataka, and ragi preparations are a staple Kannadiga food, especially in the rural parts of the state. Ragi is rich in iron, calcium and fibre, and is also gluten-free, and this is another reason why it's so popular. I have to say though that it is an acquired taste. I didn't quite take to it in the few days I was in Chikmagalur, except when it was sweetened with jaggery and flavoured with fenugreek powder and made into these little balls that were then eaten with ghee. These were quite tasty, but heavy! You see that big ball of ragi next to the rice? That's ragi mudde. Ragi grains are slow cooked on heat, with water, till you get a doughy consistency. This is then shaped into balls, drizzled with ghee and dunked into curries. Apparently you don't chew it, but just swallow it down! You either love it or you don't, a bit like marmite. I didn't sadly. But if you're in Karnataka, definitely give it a go! The other tasty Kannadiga preparation I had was a fermented rice and coconut pancake called Sannas. Light and fluffy and very delicious. Went beautifully well with a vegetable curry. What's your favourite Kannadiga food?